Soviet Communism | What's Left? My wife, my friends, everybody I know is pissed that I’m not more pissed off about that horrible, horrible man Donald Trump. That I seem pretty sanguine about the hurricane of political, social, and human destruction Trump and the GOP have wrought in such a short period of time or the damage they will continue to inflict for decades to come through, for instance, the Supreme Court nomination of Brett Kavanaugh. So, why am I not more freaked out about Trump? The answer is that, in my lifetime, I’ve seen this nation’s relatively liberal politics go consistently downhill and rightward to the present. I first became aware of American politics writ large when I was 8 years old, when John F. Kennedy won the presidency in 1960. My parents had been Democrats and Adlai Stevenson supporters, so my frame of reference started from a liberal “Golden Age,” the “one brief shining moment” that was the myth of JFK and Camelot. But unlike many people who believe the fifty-eight years that followed have witnessed ups and downs, good times and bad, pendulum swings left and right, and are therefore upset, desperate, and obsessed with the rise of Trump, I see those years all of a piece, a steady right wing devolution as we go straight to hell in a handbasket. The relatively lean, muscular structure of the American state prior to 1929 permitted the nation to create an empire—by conquering the native populations, expanding its rule from coast to coast under Manifest Destiny, and asserting its power across the western hemisphere under the Monroe Doctrine. Franklin Delano Roosevelt, in confronting the challenges first of the Great Depression and then the second World War, radically transformed American government in riding a wave of socialist/communist militancy. FDR crafted the modern warfare/welfare/corporatist state that attempted to democratically sidestep the excesses of Soviet Communism and European Fascism while outflanking the Old Left’s upsurge domestically. Considered the height of American Liberalism, the New Deal has been disingenuously celebrated by that same Old Left even after a smooth political transition to the rabid anti-communism of the Eisenhower era. The guns-and-butter Kennedy/Johnson years continued the anti-communist military intervention and domestic social welfare expansion permitted by First World economic affluence, as New Left* activism and organizing surged. It must be remembered that Nixon arguably was the last liberal president. These two prolonged separate Leftist periods were when progressive coalitions mobilized to move the Democratic party and American politics dramatically to the left. Four briefer, distinct occasions when ultra-conservative coalitions mobilized to purposefully move the Republican party and American politics profoundly to the right need also be noted: McCarthyism and the era of “Father Knows Best” morality; the prefiguring Goldwater presidential campaign; the rise of the New Right presaging Reagan’s presidential bid in a new age of austerity; and the Tea Party movement that anticipated the rise of Donald Trump and independent Trumpism. Yet Democratic party governance after 1975 was not a reversal or even a holding pattern so much as a more gradual rightward descent: Carter with economic deregulation and Cold War escalation; Clinton in slashing welfare and promoting free trade; and Obama as the drone-bombing-deporter-in-chief and TPP champion. I’ve summarized this country’s inexorable political slide to the right over the last half century. The changeover from Keynesian affluence to neoliberal austerity however hints at something more fundamental underlying American politics whether you see those politics as a swinging pendulum or, like me, as a steady flush down the porcelain highway. American capitalism made the switch from making profits out of industrial productivity to financial speculation somewhere around 1975, accounting for both the decline of the 60s New Leftist surge and the defeat of the 70s labor upsurge. In commercial capitalism profit is extracted almost exclusively from circulation, from trade, from the buying and selling of commodities. Under industrial capitalism profit is extracted not just from circulation but also from the labor process in which factory workers are paid less than the value they produce from their labor—from surplus value. Surplus value is then used to construct more factories and to hire more workers for wages in an ever-expanding cycle of profit-making. But capitalism suffers from a tendency for the rate of profit to fall (in the interpretation of Marx I favor), which not only results in the boom-and-bust economic cycle we’re all familiar with but also in an increasing inability to sustain industrial production. In my lifetime we’ve seen industrial production become so unprofitable that US industrial labor has been outsourced and factories moved to the Third World, resulting in America’s overall deindustrialization and conversion to a service economy. More and more, capitalism in the US is based on extracting profit from financial transactions and speculation, a far less profitable form of capitalism then even the trade in commodities of commercial capitalism. Capitalism worldwide also suffers from the same declining rate of profit, meaning that in China, Vietnam, and other Third World nations industrial production is contracting, meaning that industrial capitalism is slumping internationally and being replaced by finance capitalism. Finance capitalism is not merely a capitalism in decline, it is capitalism heading for the mother of all crises. Some students of the 1929 Great Depression have contended that, in liberal democracies, deep economic depressions as suffered by the interwar US are conducive to the growth of socialist movements whereas runaway inflations as experienced by Weimar Germany are favorable to the rise of fascist movements. During depressions, people who have no money or work are screwed but for those who do, money has value, work has meaning, and society has integrity, giving the edge to socialism which values labor. During inflations, it doesn’t matter whether people have money or work because money has no value, work has no meaning, and society is crumbling, giving the advantage to fascism which values power. A similar dynamic can be seen in the transition from industrial capitalism to finance capitalism in liberal democracies. In industrial capitalist societies, work and capital are intrinsically productive and so leftist movements and ideologies are widespread. Government spending and services grow, welfare programs and economic regulation expand, and the public realm and labor unions are endorsed. In finance capitalist societies, work and capital are mostly unproductive and so rightist movements and ideologies are prevalent. The economy is deregulated and financialized, the welfare state is rolled back, labor unions are crushed, the public realm is privatized, and government spending and services are cut back. About all they have in common is an aggressive, interventionist foreign policy. Marxists consider industrial capitalism in terms of constant vs variable capital while consigning finance capitalism to the category of fictitious capital. Whether Keynesian or neoliberal, democratic or authoritarian, the state serves as the monopoly of legitimate violence, the bulwark for the existing social order, and the lynchpin for the nation and economy. The state functions the same whether under affluent industrial capitalism or austere finance capitalism, so why does society exhibit leftist unrest in the former and rightist agitation in the latter? A staid principle developed in the 1950s was that of the revolution of rising expectations in which “rising expectations embodied the twentieth century’s ‘real’ revolution insofar as it represented for the vast majority of the world’s population a break from centuries of stagnation, fatalism, and exploitation.” The growing affluence from 1945 to 1975 caused expectations to rise in the population at large all over the world, which in turn lead to civil unrest, insurgencies, and revolutions according to the theory. But did persistent austerity after 1975 cause the opposite: widespread social reaction, stagnation, and obedience? The results are dubious either way the theory cuts. The inconclusive empirical evidence, methodological constraints, and conceptual criticisms of the whole revolution of rising expectations thesis makes it useless. I’m of the Marxist mindset that the social superstructure follows the economic base much as form follows function in the principle enunciated by modernist architecture and industrial design. It also means, in a Gramscian sense, that social superstructure can gain autonomy to act back on the economic base, but the starting point is crucial. We make our own history, but we don’t make it as we please; we don’t make it under self-selected circumstances, but under circumstances existing already, given and transmitted from the past. I just snuck in another Marx quote. 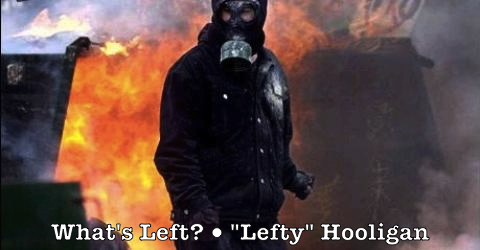 *New Left in this case does not refer to the politics that grew up around organizations like Students for a Democratic Society but to Leftist organizing and movements that flourished from the Civil Rights movement beginning in 1955 to the collapse of the anti-Vietnam war movement in 1975. SIGNIFICANT DATE RANGES: Old Left: 1930-50; New Left: 1955-75; Keynesian industrial affluence: 1945-75; neoliberal finance austerity: 1975 onward; McCarthyism/Eisenhower era: 1950-1960; Goldwater campaign: 1963-64; New Right: 1980-88; Tea Party/independent Trumpism: 2009 onward.